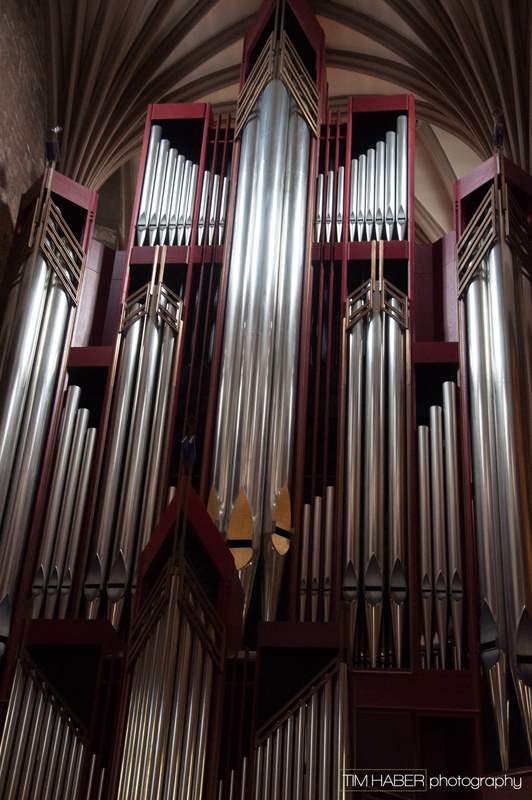 Organ pipes are fabulous in the right lighting and environment. The way they’re arranged and reach skyward, metal or wood, their surrounding airy openness or structural containments, all add to the beauty that catches my eye. Here at St. Giles’ Cathedral in Edinburgh, not knowing what I would find as I explored, the pipes’ sheen and inspiring grandeur caught my eye immediately as I walked further through the aisles. They shone with a bright softness in the natural light that cast delicate shadows on the pipes and surrounding South Transept, the ruddy toned Austrian oak encasement and cross design of the central metal pipes.